Portugal is a European Civilized Nation and a Secondary Power located on the Iberian Peninsula to the west of Spain. Initially, Portugal starts off having recently lost its colonies in the Americas in the form of the independent Brazil, and only possesses fragments of its centuries-old empire, including the coastal colonies in western and eastern Africa, as well as small colonies in Asia (Macao and East Timor) and Goa in India. But Portugal's biggest strength is in its potential for colonial expansion—Macao and East Timor are close to uncolonised Pacific land, and Mozambique encloses two high life-rating regions which can be colonised early on. With Africa surrounded by colonies, Portugal can take significant chunks of the continent if prepared well in its goal to restore the Portuguese Empire. Its biggest weakness is in its isolated position in Europe and relative strength to its neighbour Spain. The lack of NF (1 in vanilla, 2 in AHD). In HOD this is not needed directly to colonize, but high literacy and clergymen is still needed, to keep its secondary power. You must be at least a secondary power to colonize. 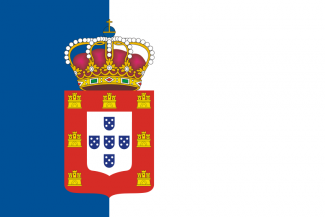 It's also more and more difficult to colonize with Portugal in AHD: Portugal is often oscillating between the 15th and the 20th rank at the beginning of the game, right on the border of being or not being a secondary power. You can ensure your status by waging war constantly, but that's a brutal and economically difficult solution. The low literacy of the country forces you to focus almost exclusively on colonial techs such as Medicine, Nationalism and Imperialism to stay even with more literate colonial nations such as United Kingdom, France, or the Netherlands. However, the benefits of a large colonial empire for Portugal, namely prestige and populous African or Asian territories, outweigh these cons. First of all, one can begin by colonizing Mozambique and Sena: the first is rich in fields and will provide you good resources to develop and feed Portugals large colonial army. Sena is good because of its wheat resources and because of precious metal resources in the middle of the game. The army will probably be focused on the war against Oman (if you launched it), so it can't help you to colonize the region faster than usual, but since no other countries can compete to take these regions, this is not a big deal. As long as one is colonizing northern and central Mozambique, one should can research Medicine and build ports in Timor-Leste (Dili), the coast of northern Mozambique (Ibo, Angoche, and Mozambique) and possibly Macao. If everything is alright, ports will be built exactly when northern and central Mozambique colonization is over. That is perfect since Portugal now has colonial power free to keep on colonizing: the islands of Mayotee, and Comoros in Africa and the Alor in Indonesia are now waiting for you. One does not have an unending amount of colonial power to colonize, so a choice is likely to be taken; it's difficult to have the three, but not impossible. One can take Mayotte and The Comoroes first, as France will not wait to colonize it, but be aware that the Netherlands or more rarely, Britain may try to capture Alor. By the year 1845 one should have taken all possible colonies with a liferating of 35 or 30. One can use your two National Foci to develop the economy by supporting capitalists in the regions of Lisbon and Porto (traditionally the two industrial hearts of Portugal.) If one wants to play a very expansionist and colonialist Portugal, one can consider not researching any tech between 1849 and 1850. In 1850 comes the "Nationalism and Imperialism" tech that costs a lot of research points, but that will allow Portugal to colonize other territories, so save for it. Obviously it doesn't take you twenty years to colonize two regions. In two or three years, you can easily colonize both Zambeze and Kazembe regions. The Areas around lake Victoria, Cameroon and the Gold Coast is the most valuable parts of Africa. Portugal can easily colonize the areas around Lake Victoria and Cameroon without real compitition. But the other powers of Europe has colonies at the Gold Coast. It can be very hard to take these regions. One might want to prepare for 1870 by annexing either Sokoto or Danish Ghana. Given Portugal's potential for colonization it is important to invest in a strong navy to help colonize and defend the new territories. Buildup your fleet and also your naval bases, particularly in your colonies, to make colonization of nearby regions faster. However given the state of Portuguese finances maintaining a significant navy will be challenging, but something that will be necessary to do to the greatest extent possible. A mixed fleet with a minority of ironclad vessels and a larger number of wooden frigates and men'o'war could help a Portugal player build up a large but affordable navy. Spending more than three years on this war is dangerous for your economy and should be avoided. With its South American possessions having recently gained independence before the start of the game, Portugal has lost what was the crown jewel of its empire. However, regaining at least some of it is certainly not impossible, making Brazil another interesting but much more challenging target. It is suggested that Portugal enters an alliance with the UK, France, or the Netherlands, countries that still have territories in Guyana, on Brazil's northern border. Gaining military access to one of these countries' territories allows the player to use Guyana as a staging ground for an invasion. Brazil starts off with a small number of brigades, but is militarily almost an equal to Portugal because of the European country's small population and also small number of brigades. The Brazilian navy is miniscule and does not pose much of a threat to the Portuguese Royal Navy, but it can attack isolated troop transports the player uses to deliver reinforcements during the war. Thus the player has to be careful and deploy Portuguese troops with caution. The Brazilian army is usually concentrated in a large formation, and it is recommended that the player uses a force to hold it off and defeat it in battle while deploying smaller, individual brigades to occupy other regions of Brazil in the meantime. This strategy allows the player to take control of large swaths of undefended Brazilian territory quickly. The player should research economic and industrial techs early on in order to keep Portugal's economy stable during this period of war, which will take several years because of Brazil's size and the attrition rate that the Portuguese Army will suffer. Expect at least some defeats by the Brazilian army, fighting on its home territory, but they are not always a major setback, and the country's large territory makes it easier for the player to have at least some units occupying territories away from the main battles. Success in a war against Brazil will still require a lot of luck, however. It is recommended that the player first takes control of the northern Brazilian coastal region of Para, then moves on southwards in future wars against Brazil. 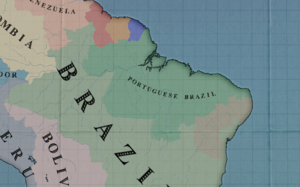 On occasion the player will gain an acquire state casus belli around the time Portugal's peace treaty with Brazil from the first war will expire, and it is recommended that Portugal then uses it to gain more territories. After the first war, the player's infamy will go down enough over the years that would allow you to demand additional territories when Portugal begins the second war and destroys the mostly unchanged Brazilian army (the Brazilian AI usually does not improve its army during the time it has a truce with the player), at which point the only thing holding Portugal back will be the lack of logistical means to occupy more territory at once. It is not impossible to obtain as many as three regions of Brazil (typically Para, Rio Grande do Norte, and Maranhao) by 1850 if one plays his cards right, although if the player takes the Brazilian option, wars with Oman and other targets will have to wait until later in the game in order to keep infamy to a minimum. Usually, the empire of China declares war on Portugal in an attempt to take the player's Asian colonies, and sometimes, even Portuguese African colonies. When the player is another country, the Portuguese AI often surrenders its lands to China, but there is no real need to, as defending one's colonies from China is not difficult. The Chinese AI will not attack Portugal proper and it usually has a smaller fleet than the Portuguese Navy, so the player just has to hold out and not accept China's demands. China will typically demand Goa, Portugal's one colony in India, and sometimes the island of Dili or parts of Mozambique; in the former case China sometimes sends troops to occupy the colony. However, if the player simply refuses to accept the demands then eventually the Chinese AI will accept white peace. When the UK or another great power begins the process of carving up China it is also possible to take advantage of the situation and gain more territory, using the Portuguese colony of Macao—which is located in China—as a staging ground for the player's troops. After the war with Oman has ended, one can march further north and attack Ethiopia. It has rich amounts of coffee which will support the Portuguese economy further. The player should not spare any standing troops for the invasion. The Ethiopian armies are weak, but they hide in the mountains and have strength of numbers, which can make the war very expensive and long term if the player does not deploy enough troops. The Portuguese Army will most likely take heavy losses to attrition alone. Thus it is not recommended to attack it until further on in the game when Portugal can build up a numerically larger army from its colonies in Africa. Try to take over most of the land before engaging in combat to cripple Ethiopia's economy. 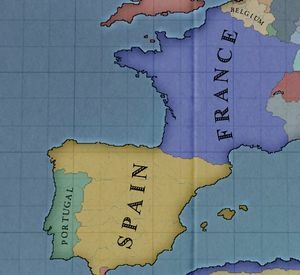 Spain is Portugal's natural enemy in Europe, but Spain is by far the strongest of the two, and it is advised to keep peaceful for most parts of the game. However, due to the relative weakness of Portugal it is recommended that one pursues the historic Portuguese policy of staying out of continental politics and focusing on expanding one's colonial empire. If one wishes to engage in combat with them France is the most obvious choice of ally. Italy might be a second choice, but they are less likely to be useful. This page was last edited on 10 June 2018, at 13:04.